I've had my JTV 69S for a few years with no problems. Last night towards the end of our set my low E string went dead using the models. Worked fine with the mags but could not get it to make a sound using any models or tunings. This morning I got out my rig to check it out and it now works fine. I was almost hoping it would still be dead so I could figure out the problem but now it seems it may be intermittent which is hard to pinpoint. Hoping someone has experienced this or can offer advice. If it's just one string, and intermittent, that may be a sign of a failing piezo pickup for that string. That would require servicing to replace the pickup(s). There may be another cause but I would keep an eye on this. If it gets worse and more frequent the piezo failure becomes a more likely cause. With the 69's bridge, the piezo's only ground connection is direct contact with the bridge itself...arguably not a wonderful design. Any dirt, dust, sweat, and other assorted crud that tends to build up under the saddles can mess with your ground connection. Try cleaning out under there and see if the problem returns...it's not always a dead/dying piezo. It is usually a bad piezo ground contact if it comes and goes. I would pull the strings and clean the bridge really well to try to get a solid ground for each piezo. IMO the Variax design is very bad in this way. They should have used piezos that each had a ground like the Ghost ones. I had lots of intermittent problems on my Variax 500 until I went to Ghost Piezos. I've had the same issue. Get some electronic cleaner and every time you change the strings, spray it so that it gets under the piezo where it contacts the bridge. Haven't had an issue since I started to do this when I change my strings. Just make sure it completely dries before you put the strings back on. About 2 minutes. Here's a link to the best stuff around. Thanks all...interesting about the ground contact. So the saddle height adjustment screws is the ground contact? 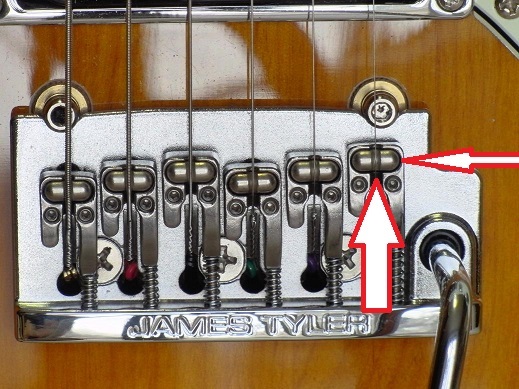 What about the screw to change intonation? I'll give it a cleaning and hope that works...problem is it has never done this before...didn't seem like bad contact while it was happening, it was just dead...nothing. The base of the pocket that the piezo sits in is how the piezo element contacts ground. So you want to clean underneath it. Just put the red straw that all these sprays come with as close to under the piezo as you can get (but be gentle. Watch out for the piezo's wire.) and spray. Keep a paper towel with you to wipe off the residue and then wait about two minutes for the rest of it to dry. Here's a picture. Notice when you take the strings off, the piezo is kind of loose in the pocket it's in. I spray in the two places indicated by the arrow in the picture. The arrow pointing up is where I can get a little under the piezo with the spray to clean it out. If any crud gets in the pocket, it can isolate the ground on the Piezo and either cause a drop out completely or just a bunch of noise. If it happens, you can usually get it working again by wiggling things around the piezo on the bridge. Both of them are involved in making a solid ground connection. It was a poor design choice, IMHO. I ended up soldering discrete ground wires to the transducers in my JTV-69 and haven't had a lick of trouble since. Disclaimer: This modification is not advised for anyone lacking solid electronic bench skills. The transducers can be damaged by excess heat! In addition to soldering skills, the job requires a temperature-controlled iron and proper heat-sinking (I use a metal-jawed hobby vise). Do the comments regarding grounding only apply to the jtv69? Nope. I had the issue on my 59 the first summer I had it - 2011. My bridge corroded from sweat, and on outside jobs on humid days, or nights with dew, the signal on my low E would cut out. I dealt with Rich Renkin, the JTV product manager (great guy, moved on since then). The first run of 59's had supply chain issues, not in spec, and they changed manufacturers. He sent me a new bridge and it's been fine ever since. My 2012 69S has not had the issue at all. The use of the piezo case as the ground was not a good design. If it maintains contact, it's fine, but if it gets corroded, the contact is intermittent, that's when you have a string volume fade or stop. HIghly recommended. Piezos going out is mostly from crap getting into the gaps of the piezo and saddle, which if covers the entire piezo, will break your ground connection. Contact Cleaner will absolutely abolish the crap that could cut out the ground connection and practically make the connection good as new. I own several JTV 59's (four) and One JTV 69 ......I've also called L6 support for help regarding this problem many times. Also, most recently I called the problem of overall volume differences between identical models. No revelations to pass along. The impression I get is like I'm the only person to report this problem....and then silence. Really? I've had most of them for a number of years. volume and temporary dead string issues. the design leaves much to be desired. sounds quite anemic compared to my others. It's gotten past frustrating. to let it penetrate the finish. Not sure whether I helped or hurt the situation. Still dead on the A string. the piezo saddle back and forth several times all the while, I had the modelling on and plugged into a pignose amp. As I'm turning the saddle adjustment, I'm hearing dead, crackle, weak signal, a little stronger, then full on. I continuously rotated the adjuster screw and saddle back and forth several times. I think (at least I'm hoping) it helped to clean the connection and it's been fine for a couple of days now. Tempted to bring it to a gig, but not without backup. clean and reassemble them. As a person with Computer and Electronic background this makes a lotta sense. Sweat, dead skin, oxidation will surely foul an unsoldered connection. Can't believe the engineers did not see this potential problem. Zero support. I'm extremely PO'd at the support staff right now for their unwillingness to give straight answers. Considering the investment I've made, I feel that Line 6 should've addressed this problem much better. What I've found ....well It's the best I've been able to come up with so far. Unfortunately, relying on incidental metal-to-metal contact (between dissimilar metals in some cases) is a terrible design choice for audio ground return. It's probably behind a good percentage of dead or weak transducer complaints with '59s and '69s. Those of us with bench skills have added dedicated ground wires to our instruments and don't deal with this chronic flaw. I agree that this design flaw is a real weakness. I think it's worse for folks that tend to sweat and get it on the bridge during playing. Pretty soon you have a bad connection on at least one of the piezos. I replaced the piezos with Ghost saddles on my Variax 500 several years ago and it' been perfect ever since. Two wires per pickup is the right way to do this. Same thing happening on my variax acoustic. Asuume same root cause ?